If you are going to start construction work and you want to optimize your costs, brick calculator is up your street. This tool helps you estimate how many bricks you will use up to cover a particular surface. With this tool, also known as the mortar calculator, you will be able to order as much building material as you need, and no more. This article will explain to you how mortar calculator works and how you can use it to accurately estimate how many bricks you need. The area that a single brick covers (the "depth" of a brick is irrelevant in the calculation). Size of the mortar joint. The size of the wall (again, it's only surface that matters, we don't care how thick the wall is). You may provide the width and the length OR go straight for the square footage. The brick calculator will estimate how many bricks you need. What's more, there is a function which counts the wastage, that means the percentage of the bricks which can be destroyed. As a result, the brick calculator provides you with 2 numbers. The first one tells how many bricks you would need to build a wall of particular dimensions, while the second one shows how many bricks you need while taking into account inevitable wastage. Mortar calculator is a useful tool for every builder no matter his level of experience. 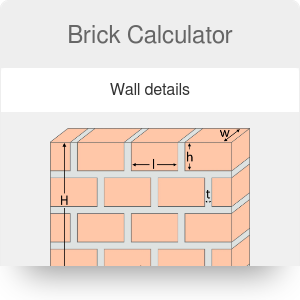 This application makes it easy to calculate how many bricks or other materials you need to finish particular work. With mortar calculator you can avoid buying too large or too small amount of material. Thus you save your money because you don't have to pay for the excess of ordering too much, or deal with the delay and hassle that comes with needing to reorder. There are, of course, different ways to count it; however, the more accurate the estimation is, the better for you. If you're involved with interior decorating, and need to know how many tiles you need to cover a wall or room, you'll be better off using our dedicated tile calculator, which does the same thing, only for tiles. You can also estimate the usage of other buildings materials. If you want to plan how much cement you will need to buy, check our concrete calculator. Brick Calculator can be embedded on your website to enrich the content you wrote and make it easier for your visitors to understand your message.